A newly-released Jewish prayer book guides worshippers at the Western Wall in Jerusalem through the world of Shabbat and holiday liturgy, presenting the full Hebrew text of the prayers alongside a fully-translated and transliterated English text. 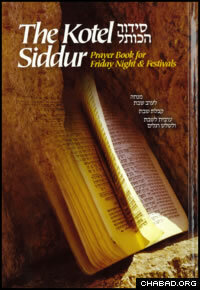 Arranged according to the rite known as Nusach Arizal widely used in Chabad-Lubavitch centers and synagogues all over the world, The Kotel Siddur was published and distributed by the Western Wall Heritage Foundation. Featuring user-friendly icons, the book also alerts users on when to stand up or sit down during prayer services. “This is among the best things that have happened for the Wall,” exclaimed Rabbi Shmuel Weiss of Chabad of the Western Wall. In addition to the hundreds of new prayer books now available to visitors of the holy site, the Western Wall Heritage Foundation expects to distribute up to 50,000 copies to various groups of tourists. The books will also soon be available for purchase in advance so that visitors can take them home. Rabbi Zalman Goldstein, author of such award-winning Jewish guides as the Shabbat Table Companion and Going Kosher in 30 Days, compiled and translated the new prayer books. “Of course this is a huge privilege for me,” he said.